Plants vs Zombies was one of the most addictive games released last year. Since its initial release on the PC and Mac, the game has been adapted to the iPhone, iPad, and is even coming to Xbox Live Arcade on September 8. But that wasn’t enough for Popcap, makers of Plants vs Zombies. The company announced it plans to release a Nintendo DS version early 2011. For those who are not familiar, Plants vs Zombies is a tower defense-esque game. 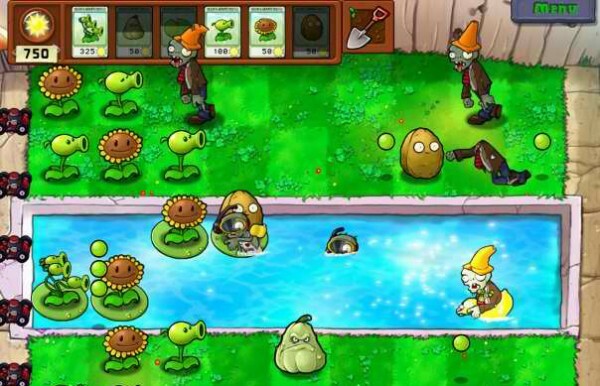 Players defend their home by placing down a variety of plants to ward off incoming waves of zombies. As with any tower defense game, progressing through the game will provide stronger plants as well different enemies. A variety of zombies attack including football players, Zamboni drivers, and pole-vaulters are challenges. To complete the game, one must defend all parts of the home. Progressing from the front yard, to the backyard, and finally, to the roof. Popcap states that the DS adaptation will feature gameplay from the original, including Adventure, Survival, Puzzle modes, and even mini-games. In addition, the company states that it will also have some exclusive game content as well. Gamestop is now taking pre-orders for the game, which will retail for $19.99. Although Plants vs Zombies is quite popular on iOS devices, I don’t believe that creating a DS version will yield the same results. The allure of the game was being able to play for 5-10 minutes such as when standing in line or riding the bus. Additionally, a game on a mobile device, ensures that the owner will have it with him at all times, making the $2.99 investment more tolerable. The price increase to $19.99 may be the downfall of the game, unless a significant amount of new content is added. This game is awesome! I don’t have a DS, but my friends who don’t have smartphones will love it!